Football Manager is a football management simulation game developed by Sports Interactive and published by Sega. That's pretty much all there is to it, easy to play difficult to master. May also consume your life. I've not seen a Football Manager thread in all the years that I've been on (S)ONM I wonder why so perhaps it is time one was made. Feel free use this thread to discuss past glories, current saves, rants, tactics, stories, anything and everything to do with Football Manager. I'm aware of a few users on here who play but it'd be great to find others. What are people's thoughts on FM2015 seeing as it's been out for several months now? Admittedly I've not bought or played this year's game so I can't really comment. What has been your favourite save (from any version)? For me it'd probably be my Ajax save on FM12, I adored that team. I'd restored them to their former European powerhouse status and I just generally loved the players I'd found/developed/bought. Teams and/or nations you like to manage? I've never really managed outside of Europe which is annoying. I've done the odd season in South America but nothing long-term. I really would like to try managing in Asia, Africa and North America at some point. Outside of the usual European leagues, I've also managed in the Czech Republic and Scandinavia. I'll give it a day before this thread slides into the abyss ._. Finally I have somewhere to document my many glories! Got FM15 for Christmas, started Boxing Day. Now on about 70 hours game time, though Steam keeps knocking a couple of hours off sometimes for some reason. I'm loving it so far, big improvement on 13 and 14. After seeing screens before getting it, I was worried I wouldn't like all the new layouts and things, but it's grown on me. Seen a lot of people complaining abut the new player interactions. Only issue I've had is the near player revolt when we got close to administration. I'm more concerned about how other managers are dicks when you loan players to them. They don't stick to agreements and then you talk to them about it and they get super stubborn and say the player's eton mess. Favourite save has to be my Dover save from FM12 where I took them from the Conference South to the single greatest team of all time, unbeaten in all competitions for I think it was 6 or 7 seasons. Even going one year without conceding a goal in the Premier League. I won basically everything in that save. Even the World Cup, twice, with England thanks to the best player in the world, Jack Richardson. I signed him from Arsenal at 21 for £6.5M. Only significant competitions I never won were the Europa League, last 16 was my best, and the European Championships, I resigned after winning the first World Cup and got reappointed after regretting it two seasons later. Though I still regret never winning the JPT after losing the final on penalties against Huddersfield. Although, current save on FM15 is really fun, just because I love the league I'm in at the moment. Cypriot B Division. Of all things. I got loads of additional leagues so that I have every league in Europe as an option and chose Cyprus first on a whim. I got classen's Megapack from the SI community forums, it's got every league you could ever want. Turns out Cyprus' second tier is incredibly fun and the best challenge I've had in FM. 14 teams, 2 automatic promotion places and 4 relegation places. Almost a 3rd of the division get relegated. So in a relegation fight, boy is it tough. There's also little to no income as only the top division has prize money, I think, gate receipts are pathetic and no one pays money for transfers. This means your club's finances are a ticking time bomb. Get promoted from an almost impossible division if you're not a recently relegated A Division club or go bust in a few seasons. Started at AE Zakakiou, got sacked after 8 months following a takeover. Dropped a division to Chalkanoras, won 5 of the final 6 games of the season to fluke promotion. Have since finished 3rd and 7th. Near the end of the 4th season and currently 5th. Considering getting this, as I love Manager Mode in FIFA and have always wanted it to be more in depth, which this looks to be. Do console versions ever come out? And are the PC requirements high? ABoxerWhoIsPacifist wrote: Considering getting this, as I love Manager Mode in FIFA and have always wanted it to be more in depth, which this looks to be. Do console versions ever come out? And are the PC requirements high? There's a handheld version for Vita which usually comes out towards the end of the season and is the slimmed down version, FM Classic. The full version is PC only but doesn't take exceptional requirements. My old laptop which was about 5 years old was running versions with all English leagues loaded fine. Better specs just let you run more and more leagues for deeper immersion without getting ridiculously slow. Okay then, will probably pick this up in the near future. Can anyone report on the IOS version? Always been interested in Football Manager but never given it a go, if it's decent on IOS I may give it a go. No idea about the iOS version, completely forgot it was a thing. 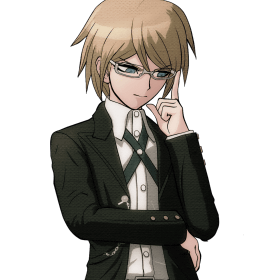 I know that it's the same cut down FM Classic as the Vita version though. One thing I've seen browsing forums like FM base and the SI Community is that so many people think 2015 is the most bugged version of the game yet. Mostly down to player interaction. I don't think any of it that I've experienced is a bug. 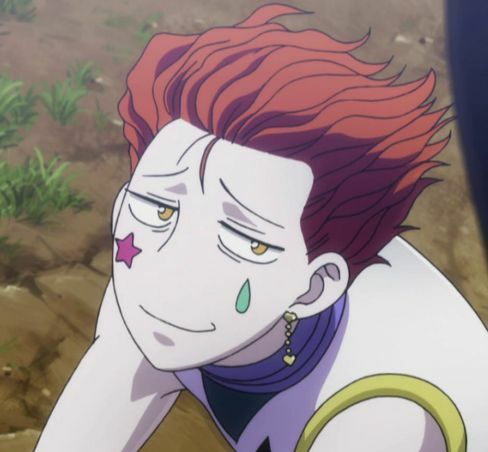 One good theory I've seen is that the people complaining have terrible Man Management and Discipline stats when distributing their stats at the start of the game. Which might I add is a pretty damn cool new feature. 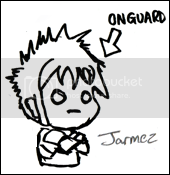 Being able to assign myself as the Attacking coach is great. My stat for it is 15 after 5 seasons, so amazing for the lower leagues I'm still managing in. My teams have no problems scoring. Been managing my hometown club, Bury FC, and doing a mighty fine job of it. First season, managed to make the playoffs thanks to actually using Man City as a proper parent club (at one point I had seven loans, four of them being from City) and Nicky Adams being in the form of his life. Sadly Newport County knocked us out and Rene Howe nicked the top goalscorer award from Adams because of that. Next season, we were top at Christmas, but then form started tapering off a bit and Plymouth stole the top spot. Took til the last day of the season but I managed to get promoted in third, and guess what? Nicky Adams was top goalscorer in the division with 27 goals. He doesn't even play as a striker! Currently 2nd in league one with ten points from the first four games. I suppose choosing Bury's a bit of a cheat because we've actually got a decent squad for League Two and can basically abuse the system to get a load of good players off City. I've had Pozo on loan from them for three consecutive seasons now and he's pretty much my main striker. Also can recommend Shay Facey as a good choice for defender/wingback at that level. Of course, because I made a Japanese/Italian manager, I'm slightly cheating and able to get players from Serie A teams, although so far the only ones I've actually signed are goalkeepers. Since I can't scout Italy due to the cost, it's a bit risky. So, this just sort of happened. Then won my next game 8-0. 17 goals in 2 games. Admittedly both teams were relegation candidates, but still. Considering how I may not like it I'm just going to wait for it to go on sale on iOS, not that it's expensive at £6.99. Only one I've played seriously was 2013, where I took Oldham to winning the champions league twice in a row, premiership twice, FA cup three times, although somehow I never won the community shield. Then I was appointed to the England job and won the world cup at the first attempt, and decided since I had 2014 by then that that was a good place to stop. Never got into 14 in the same way for some reason, but I'm really enjoying 15 at the moment. Certainly an improvement over the earlier ones, although the transfer system seems much more complicated having to rely on scouting for positions, rather than being able to get a list of viable targets immediately (unless I haven't found how to get to the list of players who might realistically sign for you I guess). pokemaniac212 wrote: Only one I've played seriously was 2013, where I took Oldham to winning the champions league twice in a row, premiership twice, FA cup three times, although somehow I never won the community shield. Then I was appointed to the England job and won the world cup at the first attempt, and decided since I had 2014 by then that that was a good place to stop. Do you mean Shortlisting? That's one of the tabs in the Scouting section and the one I use mostly for narrowing down to players who might actually be up for joining. That looked like the right thing when I was exploring, but I couldn't get it to actually put any players on the shortlist, no matter what filters I put on, so I'm probably doing something wrong. You actually have to add players to your shortlists outside of the shortlist bit. Add To Shortlist is in the transfer menu on player profiles. It takes a lot of tedious searching around players outside your scouting range. Once you know the level you're at, you know where to look and it gets easier. Also, just violated the Cypriot B Division, breaking just about every record on the way. 131 goals in 26 games, won 24, lost 2. I've started a new save on FM14 in Iceland with a club called Thor, for no reason other than them being called Thor. We're a Semi-pro club in the Icelandic Premier Division. Predicted to finish in one of the 2 relegation spots (11th) and we have an £8k transfer budget and a wage budget of £3,428 a week. Our scouting network is limited to Iceland atm. This is what I'm aiming to do. Won my first trophy of FM15. Not counting second tier division titles. Cypriot Cup with Paralimni in 2022. It feels so good. Not felt so good about winning a trophy on FM for a long time. Really starting to get places in this save now. Got to start spending big though if I want to compete in Europe and keep qualifying for it. Also noted something interesting in England in this save. QPR got a tycoon takeover and suddenly became the most reputable club in England and second in Europe behind Barcelona. After a couple of seasons, they're now only just seeing success having qualified for the Champions League and I think winning the League Cup. Though they were Europa League runners up before. What's your team's reputation? Will you be able to attract better players from other leagues yet? That's usually one of the stumbling blocks for conquering Europe, I find. 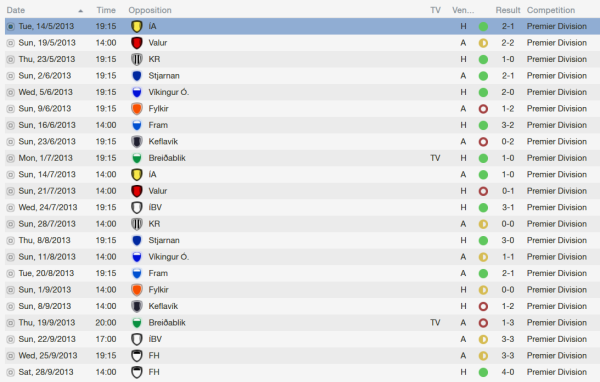 Well, we just won the Icelandic Upper League Cup which was completely unexpected so I'm delighted with that. The first time Thor have won it in their 98 year history. We're 4 games into the league and we are currently top with 10 points. Not bad for relegation candidates. We've not lost a game yet since I've taken over which has surprised me a little. The only transfer I've made was selling one of my aging CBs to Maribor and loaning him back. Partly because of a lack of transfer budget and also because I wanted to see how good my players are. I only have one RB and he is shocking, plus he got injured in the 1st league game so he's out for the season. Reputation's just about hit two stars, but is still one of the lower ones in the Cypriot A Division. I've been able to sign players from other countries no problem. All on free transfers though. One of my strikers is an Arsenal reject regen. I did manage to loan a CB from Partizan last season though. Finally got a transfer budget above 0 and my wage budget's up to £36k with a starting wage total of £14k so I should hopefully be able to put something good together. I've already arranged a couple of free transfers, but now going to start looking into spending money to try and get some more Cypriots. Want to try and keep the team as domestic as I can. My 11 for my first friendly features 6 Cypriots which is a decent amount that I'd like to keep it to. I remember trying to manage in Iceland once on FM12. It was a bit of a weird structure. Cups and leagues not running simultaneously like the preseason one with the group stage. Is that the one you won? My problem with that save was just finding players, let alone good ones. I've managed to get 2 parent clubs, Stade Lavallois MFC in Ligue 2 and RB Leipzig in the 2. Bundesliga. Stade Lavallois's available loan players keep rejecting me and Leipzig haven't offered me any yet so that's going swimmingly. Utterly heartbroken. Had my first taste of Europe after getting into the Europa League by winning the cup. Beat Armenian side Ulisses FC in the second qualifying round and NK Celje of Slovenia in the third. Got drawn against Club Brugge in the playoff. Didn't expect to get anything from it. Went to their place, was 3-1 up at half time and then they have a player sent off early in the second half. After dominating for half an hour, concede two late goals to draw 3-3. It's ok, I have away goals and am still in it. This is going better than expected. Home leg. 3-2 up with 10 minutes to go. Almost there. Then they equalise and take us to extra time. Lost 4-3 (7-6). Their winning goal was because the goalkeeper got lost after someone hit the post and was able to pounce because my keeper didn't know where the ball was. It was right next to him. Devastated. Didn't expect anything out of it and I could have so easily gone through to the group stages. My wife bought me FM15 for Christmas, sadly we moved and she has not yet found it! We are going through the loft this weekend so I hope to find it then (else I will buy it!) not played since 09 and I am hoping for big things. I always play as Leeds for a season or two first up (I know the players and can get used to the game) then play a proper LLM* game, usually starting with a Northern Irish divison 1 side (Larne being my pref). I can't wait to see how my preferred formations IRL work in the game (4-3-3 home, 4-1-3-2 away) and how long it takes me to adjust them. * Lower League managers, play the game with zero knowledge of others tactics, players or systems basically. Finished the first season. 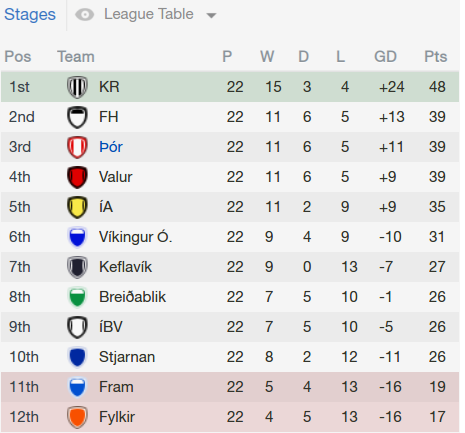 Made it to the quarter finals of the Icelandic Cup, won the Icelandic Upper League Cup and finished 3rd so I'm delighted with the season seeing as we were predicted to finish 11th. Although I'm happy with 3rd I'm disappointed we didn't win the league because we had a great start and were 1st until our 2nd loss, but even after that we were always 2nd either level on points with or a few behind KR and then we had a terrible last 6 games and let KR get away. We would have finished 2nd if we hadn't thrown away a 3 goal lead against FH in our penultimate match. We've qualified for a Europa League qualifier thanks to finishing 3rd. Really need to strengthen the squad, particularly in midfield and defense, so that I can make a proper title challenge next season. I'm hoping I'll get a transfer budget higher than £85 next season thanks to all the money we made this season but I highly doubt it. You can pay a lot of agents fees with £85. Its all about starting in the 8th tier of English football and winning the Champions League. 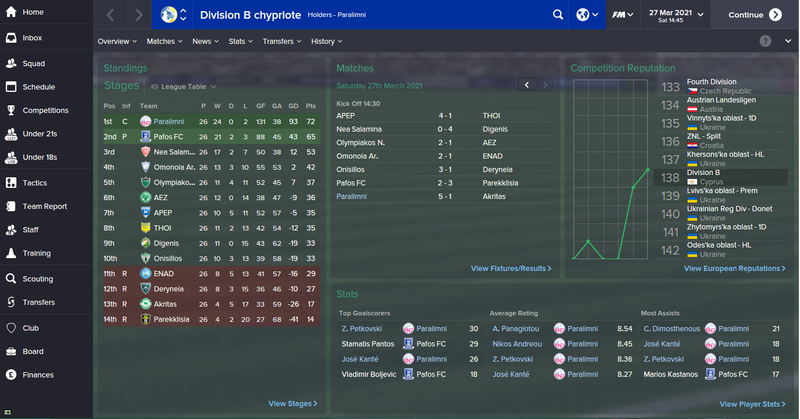 So, I progressed from Paralimni to APOEL, the biggest club in Cyprus. Had a single season there, winning the league and cup double. 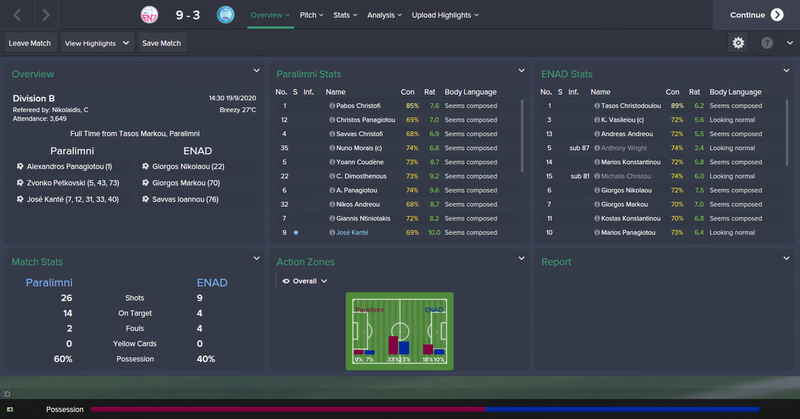 Reached the second knockout round of Europa League, I can't remember who against though, that was a while ago now. Left for various reasons. Took the Spain U23s job, got an Olympic Silver medal then got promoted to the Spain senior job. Did ok in the European Nations League, which is a nice little tournament once it gets going, 2nd place in the Division A group. Qualified for the World Cup with ease after a scary first game loss against Hungary. 2026 World Cup in the USA. A Spain squad that has gone downhill a long way since Tiki Taka. Didn't win a single friendly in 2026 leading up to the tournament. Hammered by Brazil in the first game 3-1. Beat Morocco comfortably and then drew with South Korea. Managed to scrape through to the next round. Somehow. I got all the way to the final and beat Italy. So bottom of the Cypriot second tier to the top of the world in 12 years. Not bad. Not decided where to go next though. Might stick with Spain, might go back to club football. Don't want to combine club and international.